That might be the reason clear blue is showing negative? The test that showed positive where did you get that from? You shouldn’t be doing a test every day when its so early. The HCG levels double every 48 hours and doing it every day messes with the levels. You should maybe try with a Fast Response test they detect really early pregnancy. clear blue test should definitely be able to detect that your pregnant. have you been taking any prenatal vitamins? Lou Lou 15, sometimes at 6 weeks you can have a haemorrhage? Can you go in for a scan to see? Personally I think it’s your body trying to get back to normal from the pill. i was on the pill for over 10 years and the first month i come off of my period took 6 weeks to come. It’s normal so don’t worry. Hayfc, I was only 5 weeks (from date of lmp) when I started bleeding. Doctors didn't say anything really just that it might be early miscarriage or maybe not. If it continues til next Monday to phone again. Dr was suggesting that if I had just waited and not tested early then I would be none the wiser and would assume it was a normal period. So don't think she was very concerned. She sounds..... divine, full of heart.. oh if not this time, there will be a next time my lovely! The app says 7,1. I’m thinking it’s more 6,3. No early scans unless I start spotting to check if it’s viable. Tests are getting darker and darker. I keep thinking I’m bleeding and I keep feeling funny down below! Sorry to just jump on lol! 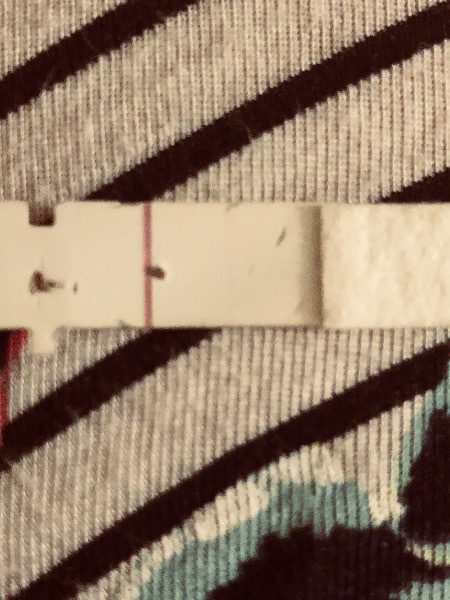 But i took two faint positives on Friday 10dpo! And now 12 dpo with FMU on a different brand I have this! Sometimes I look at it and I think I can see a tinge of pink but then I think I’m just being stupid lol. I’m not due af until Wednesday! Did you take it out of the proper housing!? There’s a very very faint something there.. try again in 48 hours. Frontline picked up very early for me. Yeah I did I needed a closer look lol with the plastic in front I couldn’t tell if my eyes were going funny! I’ll try again Wednesday morning when at is due ! That’s like me some days I’m like i must be then the next I think I’m being over dramatic! Good luck!